Bulk 6awg Solar Panel PV Wire Cable U.L. rated, and USA Made PV Wire Stranded Copper Wrapped with Tough Outer Covering for Outdoor Use. 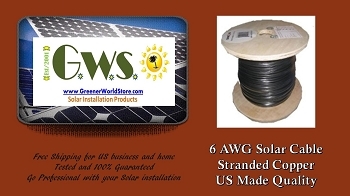 USA made Solar PV 6 awg Cable used to Interconnect Solar PV Modules Either is Series or Parallel Configuration. Use to Connect to Solar Power Systems such as Solar Charge Controller - Solar Inverter - Battery Banks etc. Easy to use 6awg Solar Module PV Bulk Cable. We offer Free Shipping to U.S. locations and territories.